Just over a year ago, I stopped going to mass. I went every single Sunday for my entire life (literally every single Sunday). Mass became an absolute chore as opposed to a blessing. The sermons were meaningless and all that was homilized was that nobody went to church (literally preaching to the choir). I shed my Irish Catholic guilt and decided that I could tolerate the wrath and shame that my Mom was going to lay on thick. I took a break, and it was refreshing. I didn’t give up my faith just changed the way that I practiced. I decided that each Sunday was going to be spiritual. Every Sunday, I woke and determined how and where I was going to connect with God. I went for a run on the lakefront, went to yoga, took my boys fishing, visited with my Dad at the cemetary or simply rested. I did what I wanted to do without the burden of hustling my family out the door early on a Sunday morning. It was refreshing. After a few months, I decided to start visiting other churches in Chicagoland. It was a great way to find an outlet to express my love and appreciation for God and to meet new people. I found that there were other places of faith that were liberal and truly accepting of others. That is me! I made my way to Old St. Pat’s in Chicago, visited suburban churches in Illinois (my favorite is Holy Family in Inverness) and rural churches in Wisconsin. Some Sundays I went to a formal ceremony and other weekends I’d find myself in nature. After a year, I finally decided that I needed that formal hour with God. I’m back to my Sunday routine. However, I don’t force my kids. It is their choice. My spiritual Sunday is my time and necessary for my peace of mind. I need it to find balance and gratitude. Last Sunday, I went to mass with my Goddaughter in St. Peter the Fisherman in Eagle River, Wisconsin and she expressed interest in getting her sacraments of Holy Communion and Confirmation. I can’t wait to be along her side during this journey. This Sunday, I was lucky enough to visit St. Theresa’s in Three Lakes Wisconsin with one of my bestest friends. It was her childhood church that she attended with her Grandparents. She is no longer a church goer so I was thrilled when she said that she wanted to go to mass with me and my Allison. We experienced pure joy at mass! First, we thought mass started at 9 a.m. (which we were already going to be late) but actually started at 8:30 a.m. We arrived way late but just in time for the blessing of the gifts so could still get communion. Believe it or not, there was not a seat in the house. Standing room only! I can understand why because we were welcomed with open arms and had the most fun (seriously fun at church) experience. During “peace be with you” every usher shook our hands and we even fist bumped! They went out of their way to make sure that we felt welcomed, the priest sang happy birthday to everyone born in August and witnessed a couple’s blessing for their 50th anniversary (their advice was to give each other space – lol)! 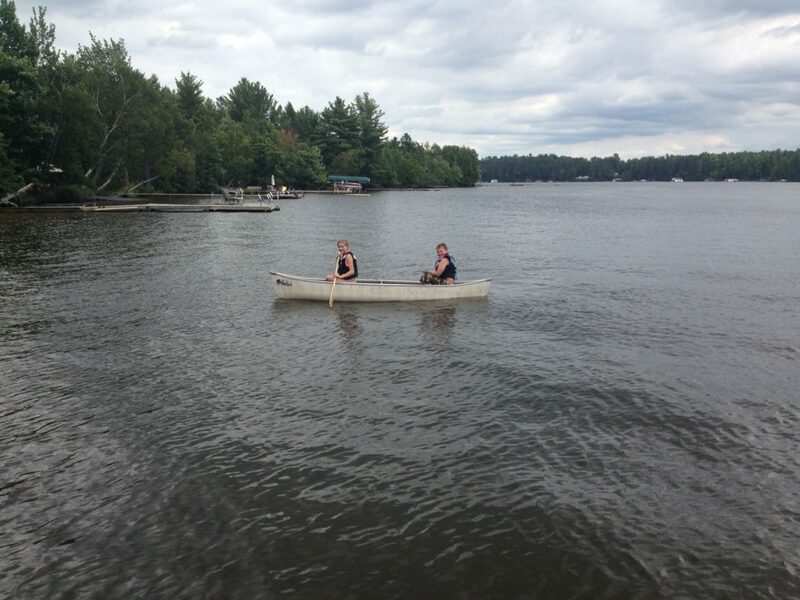 The rest of the day continued to be spiritual with a walk in the northwoods with my girls, kayak trip with my Jeffrey and a day on the water with my little family and great friends. It was the most perfect day. I was one with God which means that I’m balanced and have an open heart and mind. Do what makes you happy – be it church, nature or a day of rest. I can not wait to visit other churches to see what they have to offer! What centers you? Next Post >> 55,000 Snapchats! Oh, you read that right!